What food additives to avoid when there are so many of them? Here is a list of the top five that you may want to stay clear of, because they could have effects on your health. The other day my cousin from Russia came to visit. Apparently he doesn’t have much trust in my cooking skills, because when he came over to my house, he brought himself a sandwich for dinner. As he was eating the sandwich, I offered him some organic kettle chips to go along with it. I buy chips literally once a year and these only have 3 ingredients: organic potatoes, oil and sea salt. But when I offered them to him, he told me, “I don’t eat chips, cause they are junk food “. Sure, while you are eating a sandwich from Wal-Mart where the bread alone has a dozen ingredients. Looking at the wrapper, I saw that the thing as a whole came with tons of additives I’d never heard of before, while my innocent “junk food” potato chips only had those 3 ingredients. That sandwich isn’t alone. Many foods sold as “healthy” can be deceiving. Pick up a carton of juice or a bag of dried fruit, read the ingredients and you will often find some kind of chemicals that are added to them for freshness or just to make them look prettier. In children with chronic urticaria (the “hives”), artificial coloring was found to make the rashes worse. Other scientists currently look at the possibility of artificial coloring making the likelihood of attention-deficit-disorder (ADD) bigger, although there is still more research needed to find out for sure. This effect is said to be stronger when the artificial coloring is in connection with benzene (see below). You can find artificial colorings in cereals, canned juices, sausage, candies, commercially baked foods and soft drinks. There are many other foods but all you have to do is look at the ingredients list, and if the food contains artificial coloring, you may want to avoid it. Parabens are chemicals mainly used as preservatives in cosmetics and pharmaceutical products, but they are sometimes used in food as well. They have been said to increase the risk of breast cancer, but since I am not a doctor, I can’t place my foot down on it. Foods that contain parabens are processed vegetables, dried meat products, cereals, salad dressings, coated nuts and candy. When buying cosmetic products try to purchase those that are free of parabens. Sodium benzoate is another preservative, often making an appearance in soft drinks, fruit juices and beer. In soft drinks it is sometimes used in combination with vitamin C, where together they can form the carcinogen benzene. The amount of benzene is very low, but it may be a risk. In combination with artificial coloring, sodium benzoate may also increase the ADD we talked about. Sodium nitrite is used in many processed meats, such as hot dogs, beef jerky, ham and bacon. It is supposed to take care of the botulinum toxin that can cause paralysis and sometimes occurs in meat. But in people who already suffer from migraines, sodium nitrite can make them worse. 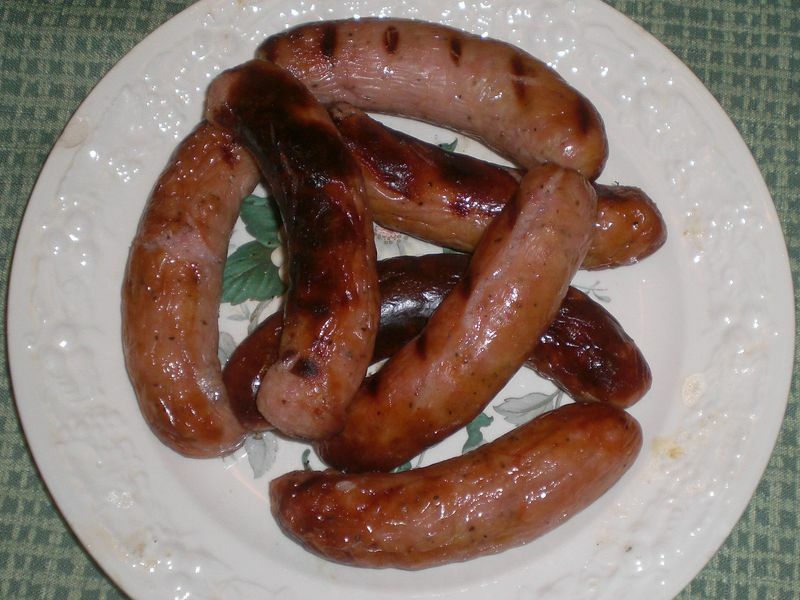 Processed meats such as sausages often contain sodium nitrite. When buying these foods, consider spending an extra 2-3 dollars but get them organic. It’s totally worth it not only because they taste much better, but your head may thank you for it. MSG stands for “monosodium glutamate”. As it makes flavors stronger, this sneaky ingredient is added to almost all food at restaurants to make it taste better. A German study found that it can increase your appetite and make you eat more, but what I hate the most about it is that it makes you retain water in your body and make you look bloated. It is also added in frozen non-organic food entries, salads dressings, canned soups and frozen meats. The above are just some of the most widely used additives, there are many more. Always read your labels, question and research every ingredient that you don’t understand, and, as I always say, if you can’t pronounce it, don’t eat it. I think it’s a great article and you’ve highlighted some of the less than common additives that some people may never have heard of. Once I brought a cookie from a store and it was supposed to be better since it was not pre-packaged. I forgot it in my lunch bag for 2 weeks because I got a new bag, to my surprise that cookie didn’t spoil. The next time I was in the store, I mentioned it to the owner, who replied that the store does not use any preservative in their in-store baked products. I just laughed and I said the cookie I got must have been magical. Great article, buyers beware. You should add carrageenan to the list.